For reliable commercial cleaning from floor to ceiling, Fuller Brush Professional Uprights offer years of worry-free use. Built sleek with remarkable durability, Fuller's Professional line offers all metal components from the handle to the bottom plate along with rugged ABS plastic shells and industrial, SJT power cords. With almost a million units already sold and enduring true commercial daily use, Fuller Brush Professional vacuums are proven machines that are built to last. The FBP line features Clean Air Technology allowing only filtered air to pass through the fan and motor system and back into the room. Each Fuller Brush Professional Upright is equipped with HEPA Media vacuum bags for advanced filtration and simple dirt disposal. 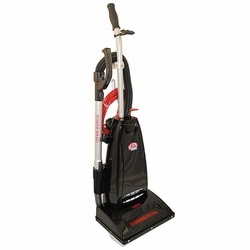 The Fuller Brush Professional FBP-14PW model features a 14 inch cleaning path and Power Wand.